1. YOU WILL GET WHAT YOU EXPECT! Not all spots can be removed from the carpet, just like not all stains come out of your clothes. Even though some of our clients have told us we perform miracle carpet cleaning or have some special or secret cleaners, the truth is: as a professional carpet cleaning company, we simply clean to industry approved specifications. Our carpet cleaning service is provided by trained, competent carpet cleaning professionals who are able to remove anything that can be removed. 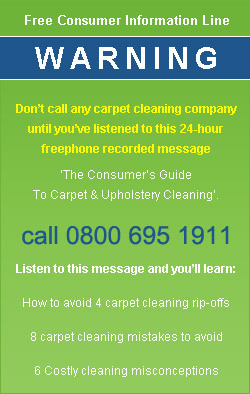 I will arrange a suitable time with you and then send you written confirmation with a free copy of ‘The Consumer’s Guide to Carpet Cleaning’.. And if we are ever late we will call ahead and let you know. I usually have an opening within a week or two, but call early to avoid disappointment during busy times. As a responsible and reputable carpet cleaning company, we promise no high-pressure sales gimmicks. The prices we quote you are fully inclusive. There are no extras - it includes all the solutions, machinery and man-power we need to get the job done right. 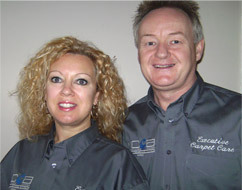 We only have one standard of cleaning cleaning – thorough, professional & exhaustive. Because of my education and experience, I can look at most spots and stains and tell you what you can expect the carpet to look like when we are finished. We use the most thorough cleaning method there is. Our method doesn’t leave a residue or cause shrinkage & is the most powerful cleaning process around. It cleans way down to the base of your carpet removing harmful bacteria and leaving your carpet clean and healthy. 7. I DON’T CUT CORNERS, I CLEAN THEM! I take all the time needed to clean every square inch thoroughly. If you have previously had a carpet cleaning company rush in and out in 15 minutes in the past you will be surprised to find out how long it takes to do the job properly. The carpets will normally be dry between 2-4 hours, depending on the weather on the day of the clean and what type of sub floor you have. 9. YOUR CARPET WILL NEVER LOOK DIRTY AGAIN! Cleaning and protecting next year at this years price. I will also include free spotting and intermittent traffic lane cleaning. We offer a lot more than the most thorough cleaning ever and a complete satisfaction guarantee. If we miss a spot or should a spot re-appear we will promptly return to re-clean it at our cost. If you are still not satisfied we will refund your money. Furthermore, after I clean your carpet if someone should accidentally track dirt in on it or spill on it, call me within one week and I will remove the spot or spill free! That's right, you'll receive the most thorough cleaning ever! Our carpet & upholstery cleaning is the best and most thorough you could ever have - if you don't agree we won't accept your payment. Any marks re-appear we'll return and re-clean for FREE. If you're still not happy we'll refund every penny! When Should you Use My Cleaning Company? If all you want is quick surface cleaning for the cheapest price possible, please call someone else. My specialised cleaning process is designed for homeowners who have a carpet they care about and want it to last as long as possible. This is why: When you call, we will schedule a convenient time for the completion of the cleaning. We want the service to be completed when it is most convenient for you. This process is designed to ensure your happiness. Let us take the work out of the cleaning for you! "Furniture and carpets look great and you certainly worked very hard to achieve this, we would not hesitate to recommend you to any friends and will obviously use you again."